A Downeaster train hit a car on Brighton Avenue in Portland on Friday morning. 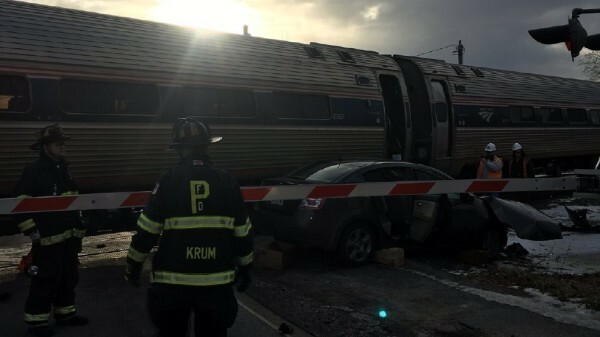 PORTLAND, Maine — A Portland man could face charges after he drove his car around a railroad crossing and into the path of an Amtrak train on Friday. Derso Mekonen, 56, drove his 2008 Nissan Sentra around a line of vehicles stopped at the railroad crossing near the intersection of Brighton Avenue and St. John Street at 8 a.m. Friday when his car collided with an Amtrak Downeaster train, according to Assistant Chief Vern Malloch of the Portland Police Department. “We are getting some reports from witnesses that the car drove around the rail road crossings, which were down and functioning properly,” Malloch said. Portland police still are investigating, but they anticipate that charges will be filed against Mekonen. Mekonen had two children, ages 5 and 9, sitting in the back seat at the time of the collision, Malloch said. Mekonen was taken by ambulance to Maine Medical Center in Portland with minor injuries. Both children, who are not related to Mekonen, were not hurt in the crash, and they were released to their mother. An Amtrak spokesperson said no one on the train was hurt. He said engineers do everything in their power to safely stop the train in a situation like this one, but in some cases, it can take a long distance to come to a stop. Rubin said he’s not surprised by the crash.